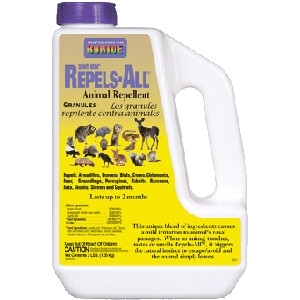 Convenient granular formulation of our all natural, and popular repels-all liquid. Triggers genetically and biologically ingrained fear and flight responses in a multitude of animal intruders - without harm. Convenient granular formulation of our all natural, and popular repels-all liquid. Triggers genetically and biologically ingrained fear and flight responses in a multitude of animal intruders - without harm. Lasts up to two months. Protects plants and property - year round. Satisfaction guaranteed. Organic and biodegradable. Not for sale in IN and NC.